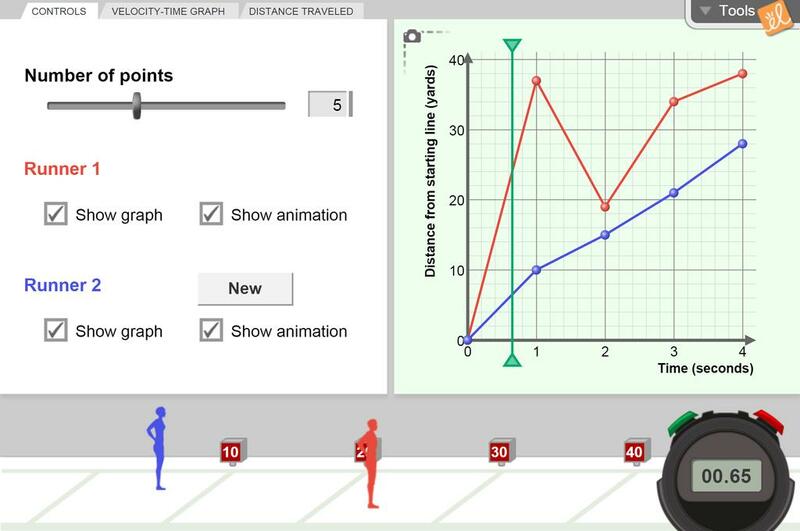 Create a graph of a runner's position versus time and watch the runner run a 40-yard dash based on the graph you made. Notice the connection between the slope of the line and the velocity of the runner. Add a second runner (a second graph) and connect real-world meaning to the intersection of two graphs. Also experiment with a graph of velocity versus time for the runners, and also distance traveled versus time. In this worksheet, students, using supplied screen shots from Distance-Time and Velocity-Time Graphs Gizm... (more)o, are asked to make and support claims concerning runners' motions, positions and velocities during 3 races. Students are asked to calculate velocities. A sample answer sheet is supplied. In this worksheet, students are asked to match a distance-time graph with a velocity graph of the same ra... (more)ce, make a claim about their choice, and fully support that claim. Teacher answer sheet included. Nicely reinforces speed, time and distance graphing with visual interactive displays. The toggle between distance vs time and velocity vs time graph was a great visual aid.